I was very pleasantly surprised recently to come across a roadworks sign in Sedgley in Welsh HERE. Well, it was my wife who spotted it, and again, her eagle-like eye alerted me to more Cymraeg in the village. This time it was the self-service check-out till at Asda. I’m not one for shopping but I had to go along and use it myself. Following the Welsh, of course. 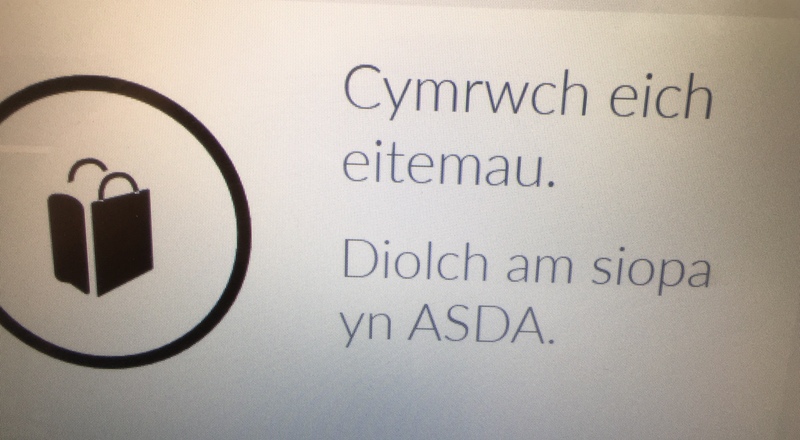 That’s the final wording on the screen above and it says to take your items and thanks for shopping in Asda. The Welsh invasion, for want of a better word, of Sedgley continues. I wonder what’s next? Considering we are 60 miles from the Welsh border in the English Black Country, it’s interesting. PS. A few days later and I’m back in the store with my wife. I go for the Welsh language option again and there’s a problem with an item that didn’t log and it says ask for assistance. My wife says, they won’t understand the screen. Anyway an assistant comes over and can you believe it, she’s Welsh. I’ve lived in Sedgley all my life and apart from a school teacher when I first started school in the 1960s, I can’t remember another Welsh person.